I ran into an issue using NHibernate + domain objects with the Syncfusion grid. I am using an auto incremented [generated identity] integer primary key that NHibernate expects to be null when creating a new item. With the syncfusion grid, the primary key is a required field on the “add new” form/dialog by default. To avoid the requirement of supplying a value in the “add new” form, you can hide the parent div of the primary key input item by using the “OnActionSuccess” client event. In this case, the field mapping is “Id”. If you are using a different edit method, the name of the form or dialog could be a different format. 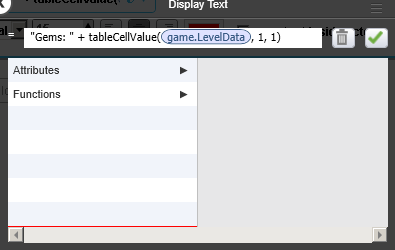 It took me a little bit to realize you can’t just type the name of the table in the tableCellValue(). You need to use the attribute browser to insert the table as a parameter. I’ve constructed a primitive batch based on the Microsoft and Farseer examples that can apply a texture to a 2D polygon. Texture configuration properties are stored in the ‘user data’ property in the Farseer Body and Fixture objects. I use the body position to determine the texture coordinates. This allows you to apply rotation and translation to the texture coordinates based on the body, in addition to the stored properties. As you can see, the textures can be applied across multiple sub fixtures. Working on a XNA game I am currently calling “Turnip Toss” using the Farseer physics engine. The editor is in early alpha stages now. 2 dimensional “bodies” and simple shapes can be created by right clicking a position on the editing surface. This is a C# method to convert a pitch or frequency to a midi note. I am shifting detected frequencies to the nearest semi-tone before using this formula. I recently hosted the first Fort Worth .NET User’s Group first SIG.